You can follow Katherine's campaign on IG @hopeheals and #dress4dignity, and you can shop for 28 of her fabulous ethically-made dresses right here! Each Friday, we'll feature the 7 dresses Katherine wore the previous week, highlighting the fabulous companies and makers that are helping us tell a better story with our stuff. Click on the pics below to learn more and buy. Then join the conversation on IG @communelle and tell us which ones you like best! Eileen Fisher is a brand in process with big goals for the future. For example, they've pledged that all of their cotton and linen will be organic by 2020, and that their merinos will soon come from sheep that are humanely raised on land that is sustainably managed. They've also promised to move from rayon to Tencel and to use more recycled fabrics. Since 2009, Eileen Fisher has been working to shift their global dyehouses toward responsible chemical, water and energy usage, though their progress has been disappointingly slow--less than 30% of their products are bluesign certified. Recognizing this, the company is working with other brands to try to create demand for responsible dyes. In terms of human capital, Eileen Fisher has been working to map their global supply chain and will soon share their supply chain map online so consumers can map their movement toward true transparency. We love these efforts and hope for more progress to come! We know what you're thinking-- if you're going to spend $298 on a dress, it better be AMAZING. Versatile. Comfortable. Flattering. Chic. And classic enough to wear for years. Allow us to introduce you to the Staple Basic Midi Dress from Nashville-based Jamie + The Jones. We thought it was cute in photos, but when it arrived at our doorstep we saw what we couldn't see online--the richness of the red, how gorgeous the raw silk fabric looks (and feels), how fabulously it hangs; the craftmanship and artistry are evident in every detail. We like it with camel and gold but we think it'd look just as great with black tights and a black moto jacket. Don't love the mid-calf length? There's a shorter version, too! And, perhaps even better than its versatility is the fact that this beauty can be machine washed (in fact, because it's raw silk, it'll only get softer with each wash). That said, if you want it to stay pristine and crisp from wear to wear, dry cleaning is your best bet (Jamie + the Jones recommends machine washing it if you want it to have that lived-in, perfectly worn, ultra soft t-shirt look). We're so grateful for their generous spirit in donating this dress to Katherine to support Dress 4 Dignity! Jamie Frazier and Hannah Jones, the female duo behind Jamie + the Jones, design and make all of their colorful pieces in their Nashville studio. Their whimsical, effortless pieces can be worn dressed up or dressed down, and they look beautiful on women of all shapes. At the heart of everything these women do is collaboration--from their own symbiosis, to their collabs with the knitters and weavers and marblers who work on their garments--these talented ladies have created a powerful, female-centered, cooperative space within the fashion community, and we dig it. A modern take on a classic silhouette, we think of this dress as the marriage between a shift and a wrap. And it’s a very happy union—a slightly loose hang keeps you comfortable, but the wrap detail across the front gives you just enough contour to flatter (and the tie detail is adjustable, so you can pull it a little tighter if you just finished your juice cleanse and want to show off). We love the graphic print because it reads a little edgier than florals, but has the same pleasing effect on the eye, conjuring a sense of the natural world without being too literal about it. Bottom line: this is more than a dress, it’s an investment in a piece of art-- you’ll just hang it on your body instead of your wall. Where Mountains Meet is a womenswear brand committed to ethical, responsible sourcing and production. They work with artisan partners in countries such as India, Guatemala, and Bolivia to source many of their fabrics and textiles in an effort to cultivate the rich, skilled heritage of these communities. This dress, made of 100% silk, is hand cut and sewn responsibly in their factory in New York’s historic garment district. Where Mountains Meet describes their customer as a woman who is “part of a growing collective who recognizes that her agency, access, and options, put her in a position to help bring about change.” May we be those women. There is something to be said for a true basic. Who doesn't need a mid-calf black jersey sleeveless dress that works as a summer sun dress and a winter layering piece that can be jazzed up for a party or thrown on to run errands? 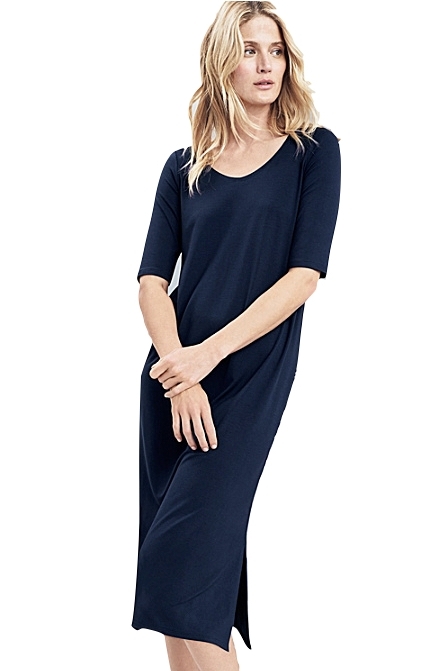 Unlike the stretch jersey dresses they sell at H&M for $20, this dress from Eileen Fisher not only fits 1000 times better (let's be honest, those super short H&M ones don't actually look good on anyone), it looks classier and will last a whole lot longer. Yes, it costs more than the fast fashion version, but you can feel good about the fact that this dress was cut and sewn in NYC as part of Eileen Fisher's efforts to support US manufacturing and not made in an unsafe factory in Bangladesh. Throw on an ethically-made hat and you're adventure ready! As we said above, Eileen Fisher is a brand in process with big goals for the future. We love these efforts and hope for more progress to come! But it's not just the ingenuity we love about Vetta, it's their commitment to social and environmental responsibility. Started by two women committed to ethical fashion, all of their clothes are made in America using sustainable fabrics and in responsible factories, including a family run factory in NYC and another in Los Angeles that uses 70% solar energy. Fabric is either deadstock (leftover fabric saved from the landfill) or sustainable (mostly Tencel, which is made from sustainably harvested wood pulp which is biodegradable). The Earth will thank you, AND you'll never have to stare at a closet full of clothes and feel like you have nothing to wear. A Christmas miracle! We love the shirt dress Katherine wore on Thursday (those buttons!) but sadly Rachel Palley doesn't offer that particular style any more. The closest we could find was this slouchy belted dress, which, okay, isn't close at all except that it's olive and it's Rachel Palley, and those two details alone are enough for us. L.A.-based Rachel Pally has been at the forefront of ethical, locally manufactured women's clothing since 2002. Her inclusive, ultra-wearable dresses are made for women of all shapes and body types. From contemporary to maternity to plus size and everything in between, there really is something for everyone from Rachel Palley. A native Angeleno, Rachel is committed to true local production. The fabrics she uses in her designs are milled in L.A., just down the street from where her garments are cut and sewn. Who doesn’t love a good shirtdress? The comfort of a shirt, the coverage of a dress, it’s everything we want in a wardrobe staple. The feminine cut of this People Tree bestseller--a slightly flared skirt and nipped waist--means no one will assume you threw on your husband’s shirt, but the soft ease of the 100% fair trade certified cotton will make you feel like you did. We're also loving the bright color, a breath of fresh, electric blue air for those of us with a closet full of black and grey. And bonus: it will look as good in January with your booties and tights as it will in May with your strappy sandals (though you might need to roll those sleeves up). People Tree was pioneering ethical fashion long before it was trendy (and before some of us were even born). The company implemented the first supply chain for organic cotton and was the first organization in the world to achieve GOTS (Global Organic Textile Standard) certification for a supply chain located in the developing world. If you want a brand that is doing it all--from social justice to environmental justice--and doing it right, look no further than Tokyo and London-based People Tree. We love that they buy the majority of their products from marginalized producer groups in the developing world, use natural resources throughout their production process, and are committed to being 100% fair trade throughout their supply chain. All that, and they’re making beautiful clothes we all want to wear--win/win for everyone involved, which is exactly what ethical fashion should be. P.S. They also make our FAVORITE PAJAMAS EVER. 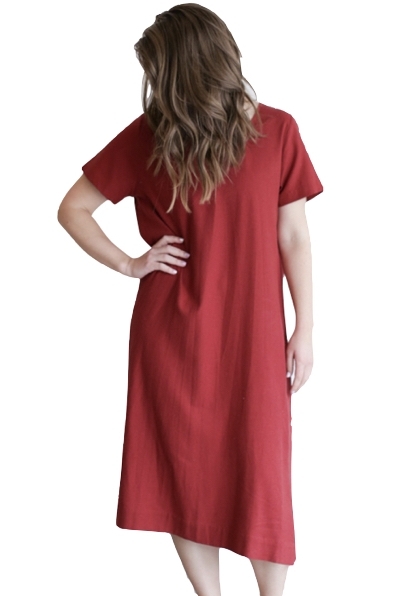 Love the rich burgundy and flattering cut of this dress from one of our favorite ethical powerhouses, People Tree. Sure, the cut and color are a bit traditional, but the ruffle detail down the front says you know how to party. And by party, we mean grab a pumpkin spiced latte on the way to your kid's Christmas pageant. At intermission, you can tell everyone about your new fave fabric, Tencel (which is what 67% of this dress is made from; the other 33% is organic cotton). Tencel is a sustainable fabric, regenerated from wood cellulose of Eucalyptus trees; it’s processed using chemicals that are non-toxic (unlike traditional cotton), uses significantly less water than cotton, and utilizes a “closed loop” processing system, meaning that 99.5% of the solvents used in the processing are recovered— rather than being released into our rivers, oceans, and air. But the use of Tencel is just one of the many reasons we love People Tree, a company which truly pioneered ethical fashion. You can read all about this incredible brand right here. It's December? You wouldn't know it in L.A. right now. With temperatures in the low eighties, it felt more like summer than winter this week. Lucky for Katherine, who got to wear this lightweight one shoulder dress from Mara Hoffman without a jacket--or shoes--while half the country was Instagramming about the first snowfall. With it's loose drape and fun flouncy ruffle sleeve, it's perfect for a poolside party or dinner after a day at the beach (if you're in need of a swimsuit, Mara Hoffman tanks are our fave). Mara Hoffman didn't start as an ethical fashion label, but social responsibility and sustainability have become a core part of the brand's identity as it has expanded, and the company has big goals for 2018. The brand is a member of the Sustainable Apparel Coalition, an industry wide coalition of brands, suppliers and retailers who are working together to improve how the fashion industry measures and reports its social and environmental impact, and is working to map its supply chain and to encourage its partners to adopt the HIGG Index. We love that Mara Hoffman is committed to using sustainable materials. All their swimwear is made from recycled fibers, and their latest collection uses predominantly sustainable materials including Organic cotton, organic linen, Tencel, and Modal. We were impressed to learn that the brand's cutting room in LA not only uses solar power, but produces so much solar energy they give back to the city! Sometimes we have to tell ourselves to NOT BUY ANYTHING ELSE WITH STRIPES because, we admit it, we’re drunk on stripes. We love them for their nod to the nautical vibe, their slimming qualities, and their ability to look both timeless and on-trend. So needless to say, we love this dress (which reminds us of one we chose for our second Edit ever). Pair it with your favorite sneakers for a trip to the park with your kiddos, or with booties and an army jacket for whatever else you’ve got going on…or haven’t got going on—it's super soft and comfy, so we won’t tell if you pretend it’s a nightgown and wear it on your couch to binge watch The Crown. Sonnet Jame (in addition to having a name we wish we’d thought of for one of our children) makes durable, washable dresses for women who want comfort, style, and a playful attitude in their wardrobe. Founded by a mom of two little boys who wanted clothes that would transition from the park to the museum to dinner out with friends, Sonnet James makes dresses that are easy to wear and easy to care for. Best of all, every dress from Sonnet James’ collection is made in a San Francisco, CA factory that was chosen by the company’s founder for the great light, ventilation, fair wages, and overall healthy working conditions it offers. New York City-based SVILU's motto is "Mindfully Made." From their fabrics to their factories, Svilu is committed to ethical fashion. Their garments are made from responsibly sourced, sustainable fabrics, and the majority of their clothes are made in small factories in NYC's garment district, just a few doors down from their studio on 38th Street. SVILU’s sweaters are made using cutting edge flat knitting machines in one small factory in Zhongshan, China, which is also where the brand's cruelty free & organic cotton yarns are spun (sourcing and manufacturing in one location means lower transportation emissions!) We weren't surprised to learn that SVILU was a recipient of the 2013 CFDA/Lexus Eco Fashion Challenge Award (CFDA, the Council of Fashion Designers of America, Inc., is a not-for-profit trade association, founded in 1962, whose membership consists of more than 500 of America’s foremost womenswear, menswear, jewelry and accessory designers). Our only beef with SVILU is that it's hard to buy their stuff! Their online shop is empty currently and the third party retailers who sell their designs have very limited offerings. Lucky for Katherine, she already had this beautiful navy dress, and lucky for us she said she'd let us borrow it whenever we want. non-profit team of global social compliance experts. We applaud their efforts so far and hope that Alternative does even better in terms of supply chain transparency and factory oversight in 2018. This dress from LA-based Dolan is a capsule essential. If only you could buy it... unfortunately for all of us, this versatile dress is no longer available. Boo! 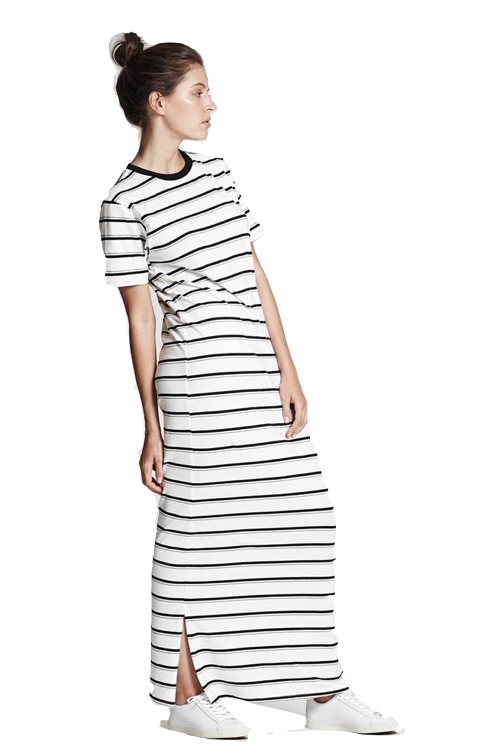 And, to make matters worse, their Willow Maxi Dress (love love love) is on backorder. So, for now, just put Dolan on your ethical radar and wait for another made-in-LA staple to pop up in the Dolan store. Haven't heard of Dolan? Neither had we, until Katherine turned us on to this cool Cali brand. Jodie Dolan founded the company in 2004 to create an effortless, modern woman’s wardrobe inspired by Jodie's world travels. Today, the company sources natural and sustainable textiles and partners with skilled artisans to create beautiful, feminine, and easy-to-wear pieces that are infused with handmade craftsmanship. Their collection is limited, but Dolan is a brand to watch. We can't let this post pass without mentioning the key necklace Katherine is wearing! It's the HOPE key from The Giving Keys. If you haven't heard about this incredible company, then check out our Under $50 Gift Edit and prepare to be inspired! You might not have a black velvet shirtdress on your must-have list, but here’s why this one is calling your name: like the Vetta cardigan dress from last week, this piece can be worn in a variety of ways— from a modern shirtdress hanging loose, to buttoned up with a bow at the neck for a more mod look, to cinched with the included sash for a flattering, romantic silhouette. Love the drape of the silk velvet, and all the special little details (those cuffs!) that’ll make you feel comfortable and polished no matter where you wear it. Emerson Fry is a small, family owned company creating small-batch, beautiful pieces that are also functional. Their production runs are limited, which means less fashion waste and more care and intention in every item they produce. Be forewarned that a click over to their site is going to involve some heavy drooling: their clothes are both stunning and perfectly wearable. The entire line is made here in America, and their stated goal is to “create jobs and support positive social, cultural, and environmental shifts.” Amen! Softest sweater dress ever. It's the perfect base for a layered look (Katherine paired it with a Reformation coat and Everlane scarf for a put together day look), but it's adorable by itself, too (don't worry, the Sand color is a warm neutral that won't wash you out). Sonnet James (in addition to having a name we wish we’d thought of for one of our children) makes durable, washable dresses for women who want comfort, style, and a playful attitude in their wardrobe. Founded by a mom of two little boys who wanted clothes that would transition from the park to the museum to dinner out with friends, Sonnet James makes dresses that are easy to wear and easy to care for. Best of all, every dress from Sonnet James’ collection is made in a San Francisco, CA factory that was chosen by the company’s founder for the great light, ventilation, fair wages, and overall healthy working conditions it offers. If you’re getting bored of your black dresses, may we suggest adding a little boho to your style? Here’s a truly sophisticated place to start. Wear it tied at the waist for a more flattering silhouette, and loose for a truly laid-back style that'll turn heads (for all the right reasons). Skillfully dyed by single moms in Malaysia, you’ll be wearing a story of empowerment every time you put it on. We've raved before: Raven + Lily's local partners employ over 1500 at-risk women in 10 countries--ladies who have been trafficked, suffer from HIV+, were previously homeless, or have come out of oppressive situations--to give them a fair wage and skills to help them thrive. If you're looking for a truly stand-out brand to support, you've found it: Raven + Lily is a certified B Corporation and was named the Best for the World in Community Impact in both 2014 and 2016. Plus, when you buy from them, you'll know exactly what your stuff is made of, and by whom. This dress, for example, was made by single mothers and widows in Malaysia through a silk manufacturer that recycles their water and uses non-toxic dyes. A staple dress if ever there was one, this little number will fit the bill for everything from a winter cocktail party to a summer soiree. We love the easy drape and the below-the-knee length, which would look great on any body type. Made in downtown LA of super soft, textured satin jacquard fabric, wear it when you want to look like a model but feel like you’re wearing a slip. So, like, everyday? Lacausa's cause is simple: to make quality garments with California ease, always under ethical conditions. Their fabrics and raw materials are all sourced from trusted partners and their garments are sewn in their own downtown Los Angeles factory which offers fair wages and a dignified work environment. But their commitment to the community doesn't stop there-- they also partner with various organizations throughout the year to offer their support and bring awareness to issues important to their team. YSTR is out to revolutionize fashion. Countering the fast-fashion model, they sew each garment to order and thus eliminate the vast majority of fashion waste; also, every stop oftheir production happens in an ethical way at their downtown Los Angeles studio, where garments are produced by artisan sewers who are paid fair wages. Finally, their transparent pricing and elimination of middlemen ensures that they can sell to us at wholesale prices. You can join their capsule club (which will make you the coolest fashionista around, and ensure access to dresses like this one!) or buy garments individually; either way, consider yourself a member of the fashion revolution. If you love the look of the classic shirtdress but not the sometimes itsy bitsy length, here's your answer. Made of crisp, lightweight poplin, this dress is lightweight yet structured. It'll be an easy throw-on-and-go staple, and can be dressed up or down. We're daydreaming about wearing it while scarfing down a lobster roll at a picnic bench on Cape Cod, but for now we'll just wear it to work. Sigh. Everlane’s mission is “‘Radical Transparency." For each clothing item they sell, Everlane breaks down exactly how much that item costs to make. Of all the brands we've featured in #dress4dignity, this might be the only one you've heard of, which tells you that Everlane's marketing strategy has worked! We applaud them for helping to spark the conversation about transparency, but we were surprised to discover that H&M is actually more transparent than Everlane. Pricing transparency is great, but we want supply chain transparency, too! Okay, you caught us. This isn't a dress. But Katherine wore it with a dress so it counts. 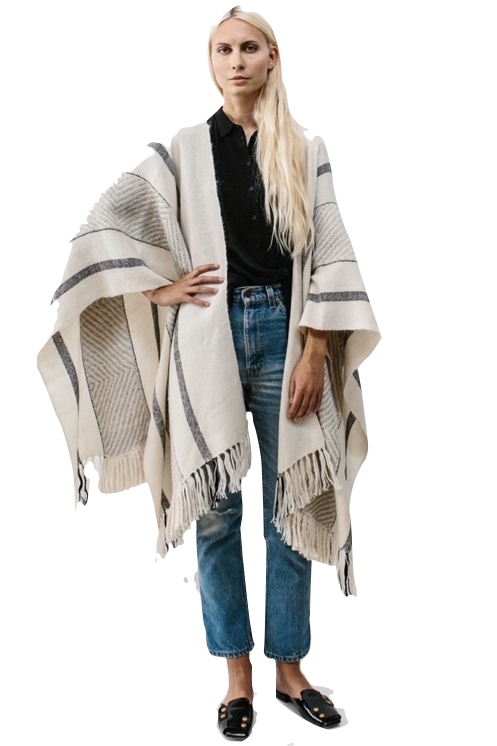 This gorgeous poncho -- handwoven with alpaca wool by artisan women in Peru -- will punch up any dress (or pair of jeans!) you wear it with. Throw it on over your PJs for school drop-off, or over your jeans for dinner and a movie. Keep it next to your bed for late-night reading, and then wrap yourself up for a morning walk with a steaming cup of ethical coffee. It's part sweater, part blanket, part miracle. We raved about Raven + Lily above, so scroll up for the scoop if you missed it. 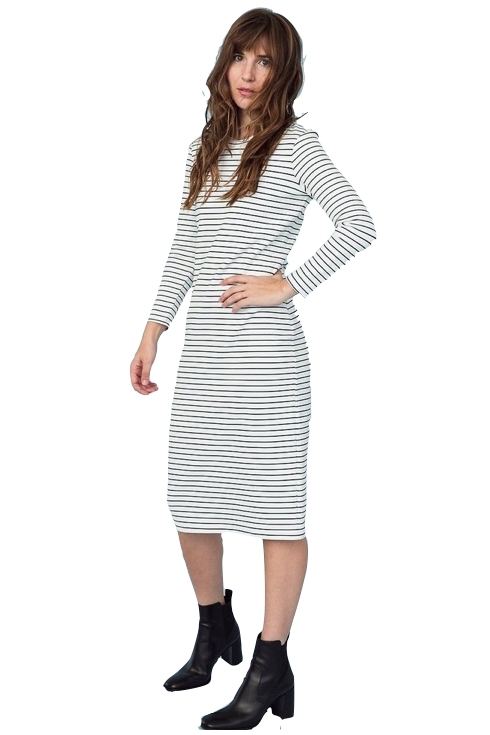 Stripes are da thang right now (we've got three this week alone), and this midi style from No Nasties shines. First, the obvious: it's brown not blue. But, even better, it's made with 100% organic and 100% fair trade cotton and printed with water-based & eco-friendly dyes with no plastisols. And, best of all, the farmers in India who grow the cotton No Nasties uses in their garments are paid a premium for community development. We'd say the name fits -- there are no nasties in these easy ethical duds. You might recognize this dress from Katherine's launch video for Dress 4 Dignity. The Marie dress from Ace + Jig is the first dress we chose when Katherine and Jay asked us to help out with this campaign. The fabric is the standout here--it's Ace + Jig's custom yarn dye woven cosmos fabric, a drapey lightweight textured singlecloth in a rich navy with stripes of black tufted polka dots. We love how substantial it feels in our hands, and how well it drapes. Ace + Jig is a brand build around textile design. While many ethical brands are making cotton basics, Ace + Jig is creating elevated garments made from unique fabrics in interesting patterns and textures. Their garments are woven by experienced textile specialists in India on ancient wooden hand looms. Several times a year A+J travels there to work one-on-one with their weavers to create their gorgeous, unique fabrics. Their Indian partners, meanwhile, not only provide free childcare for their employees but also use reclaimed water to grown organic produce for them. Three cheers for a pattern that isn't stripes and a color that's fun but not fussy. Made of 100% recycled fabric by at-risk women in Cambodia, Raven + Lily's easy-to-wear Sofia Dress comes in black, but we love this version, wine colored with R+L's classic arrow print. Katherine's wearing it here with the attached matching belt, but you can also wear it without the belt for a a shift dress look. Silver snap detailing on the cuffs add a sophisticated touch of shine. A polished dress for day, or add pumps and R+L's brass jewelry for a chic night out. We'll let you in on a secret. We wore this dress to every holiday event we went to this season. With it's jersey top and fitted but not tight ribbed skirt that hits mid-calf, this mix matched materials dress looks like something a grown up would wear but is far from boring. We love how versatile it is. Wear it with a cardigan like Katherine did (she's in Groceries Apparel's Magnolia Cardigan here) during the day, then dress it up with a bold necklace and heels for date night. L.A.-based Groceries Apparel manufactures in their own local factory to ensure their fair trade standards are met. Vertically-integrated, local, and traceable production means high quality pieces made from recycled and organic farm-to-factory fabrics, efficient production, and well-paid employees. This is a brand we hadn't heard of before Dress 4 Dignity, but you can expect to see more of them on The Edit in days to come! Yes, it's another striped dress. But this one deserves a second look. To start, those stripes were put there with AZO and formaldehyde free inks, which are better for the environment, and better for you, and the super soft cotton jersey fabric is made from GOTS certified organic cotton with some elastane added to allow flexibility and to ensure the garment keeps its shape. It's a dress so comfortable that you might want to sleep in it, which makes sense, since Australia-based ALAS started as a sleepwear brand. Since their launch in 2011, ALAS has built a reputation around the world for their well designed, high quality, sustainably produced garments, first with their sleepwear, and now with their more diverse line of dresses, underwear, lounge wear and workout clothes. All ALAS prints are created by their in-house designers and guest designers they love, with each clothing item made from seed to cloth in India under fair trade standards. We're so grateful ALAS donated this dress to Katherine for Dress 4 Dignity and are thrilled they're giving us a promo code for Communelle readers that's good until the end of January. Get a head start on your New Years resolution to #shopabetterstory this year and use the code ALASXHOPE at checkout for 15% off! The most forgiving style on the line-up this week, this relaxed tank dress from Dorsu is perfect for heavy brunching, which we intend to do a lot of this weekend. A perfect layering piece, this dress looks great with a cardigan or a blazer but also can stand on its own in warmer temps. Like all Dorsu clothing, this dress was designed and produced in-house at Dorsu's production studio in Kampot, Cambodia. The company designs, pattern makes, samples, cuts, sews, packages and sells their clothing under that very same roof, ensuring that every single garment they sell is truly fair trade. We love that Dorsu uses remnant cotton jersey (left over, unused or unwanted rolls of fabric in its original condition) from Phnom Penh (because so many garments are made in Cambodia, there is tons of perfectly good fabric that is discarded by larger brands) and produces only limited runs of each of their designs, ensuring no waste. We were also impressed to learn that Dorsu burn tests the fabric it buys to ensure that it has very little or no synthetic fibers. Planning a trip to Cambodia? Dorsu has two physical stores in Kampot; their Old Market Flagship Store and Road 33 Production Studio Store, which is located in the same building as their head office and production workshop. Visitors to that Road 33 Studio Store can see the company's production space and get to know where there clothing has been made, how and by who. This is small batch production at its best! Okay, we have to start by saying that we love Katherine's sassy pose in this pic and the way she improvised when the dress YSTR was so kind to donate was a bit too tight up top for her. Pairing this knee-length ribbed jersey layering piece with an L.L. Bean sweater vest was an unexpected but completely adorable choice. We've talked about them before: L.A.-based YSTR is out to revolutionize fashion. Countering the fast-fashion model, they sew each garment to order and thus eliminate the vast majority of fashion waste; also, every step in their production process happens at their downtown Los Angeles studio, where garments are produced by artisan sewers who are paid fair wages for their work. Finally, their transparent pricing and elimination of middlemen ensures that they can sell to us at wholesale prices. You can join their capsule club (which will make you the coolest fashionista around, and ensure access to dresses like this one!) or buy garments individually; either way, consider yourself a member of the fashion revolution.